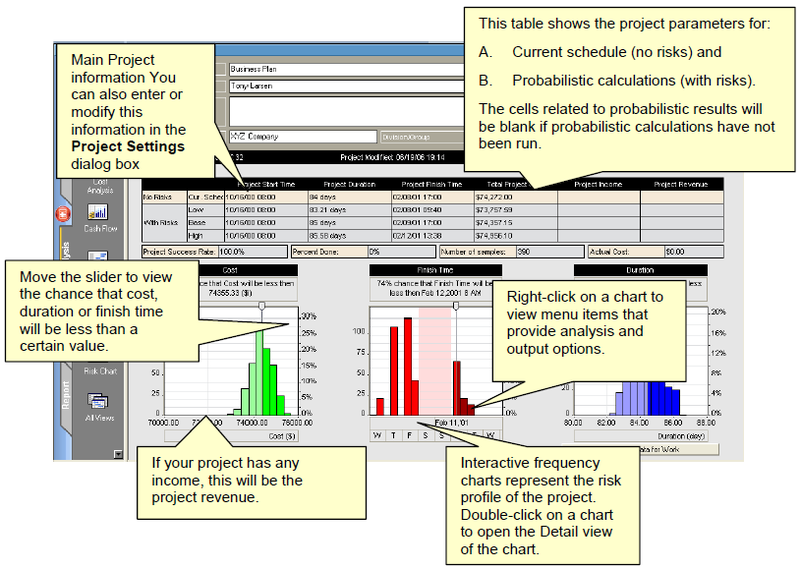 The Project Summary view shows the main information about project: total cost or revenue (if income is defined), finish time, duration, and success rate for both deterministic and probabilistic calculations. Main project information: the main project information includes the project name, manager, etc. Main project parameters with and without risks: this table is located in the center of the project summary and shows the project start time, duration, finish time, cost, income, and revenue for the current schedule (no risks) and the low, base, and high calculated results. Main project parameter frequency/cumulative probability charts: interactive charts that show the distribution of the results.